From the kitchen of One Perfect Bite...Bob and I happened on the camp meeting while looking for decent blueberries. The blue striped tent, positioned along the river and abutting the bridge couldn't be missed. I'll admit to being cat curious and instigating a trip down the embankment to the the camp grounds. We took a few pictures before being joined by Jeb, who handles security and parking for the event. He was as curious about our presence as we were about the revival meeting. Jeb kindly led us through the intricacies of the event and how it came to be. More information about events such as these can be found here. While a man of few words, when asked about attendance he ventured, "Some nights it's a healthy handful, some nights we're packed." Ever the good disciple, he clearly hoped we'd be back and spoke of that a bit, but then shared with us locations of berry fields and farms we would have otherwise missed. I had promised Bob I'd make a blueberry buckle if we could find fruit that had any flavor. Thanks to Jeb, I was able to keep that promise and we had a lovely dessert. Bob loves it because of its thick sugar topping. The topping cracks as the dish cooks and the craters in it surface are how this buckle got its name. The recipe I use was originally developed by Martha Stewart and the topping is based on one made by her mother. Both recipes are delicious and I think best of kind. I really think you love this buckle. Here are the recipes. 1) To make streusel topping: In a medium bowl, combine flour, sugar, cinnamon, and salt. Using a pastry blender or fork, cut in butter until fine crumbs form. Using hands, squeeze together most of mixture to form large clumps. Topping be frozen in an airtight container for up to 6 months. 2) Heat oven to 350 degrees. Butter a springform baking pan, and dust with flour, tapping out excess. Set aside. 3) In a medium bowl, sift together the flour, baking powder, and salt; set aside. 4) In the bowl of an electric mixer fitted with the paddle attachment, cream butter and sugar on medium speed until light and fluffy, about 3 minutes. Reduce mixer speed to low, and add egg and vanilla, beating until fully combined. 5) Add reserved flour mixture, alternating with the milk, a little of each at a time, starting and ending with the flour mixture. Remove from mixer. Gently fold in blueberries. 6) Pour batter into prepared pan; sprinkle streusel topping over cake. Bake until cake tester comes out batter-free, 60 to 70 minutes. Transfer to a wire rack to cool for 10 minutes. Remove from pan; cool for 15 minutes before serving. Yield 8 to 10 servings. What an interesting discovery on your hunt for blueberries...and what a delicious buckle you were able to make. It looks like it would be perfect with my morning cup of coffee! One never knows what's hidden in the woods! Buckles, Grunts and Crumbles - all delicious! 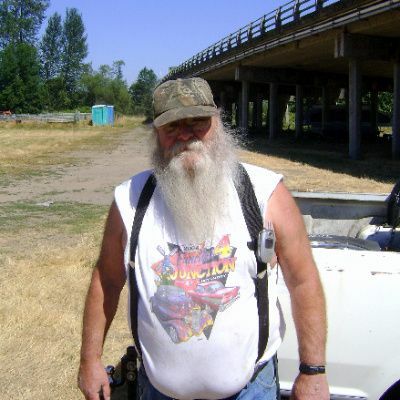 il cowboy è veramente fantastico con la sua barba e il suo cappello !!! Oggi in Italia si stà proprio bene... il grande caldo se ne è andato ! Speriamo che questa aria fresca duri ancora qualche giorno, così si può lavorare meglio ! Buona giornata... la torta è veramente deliziosa a vedersi ! Love buckle...wow...5 cups of blueberries! I am sure this taste heavenly! You lead an exciting life! and that buckle sounds and looks so good; I have to try that recipe. Yum. We are still looking for ways to have blueberries in treats as well as fresh. I really need to start putting some in the freezer to please the "winter bears". Oooo..... lucky you, Mary! You found 5 cups of fresh blueberries! Or more than that? Gosh, that cake looks awesome. Hope you're having a great time. I've been seeing buckles everywhere and I love that they are part cake, part pie. Your story of how you found the blueberries is quite entertaining...never a dull moment! What a delicious looking cake and I'm with your husband, that thick sugar topping would be my favourite part too! Have a great day Mary! I'm so excited for this time of year - buckles, cobblers, and crisps and all that wonderful fruit! Blueberry is one of my favorites - I'm made Martha's Blueberry Crisp, so this is next on my list. Oh gosh! This is the first time I saw this.... YUM!! I keep seeing recipes with blueberries as the star ingredient and keep wishing there were a abundant supply of them in my part of the world. I think that this week I will hunt for some and pay whatever price necessarry to satisfy this craving I've got going for them. Your cake looks divine and just the sort of thing I fancy baking. Unexpected discoveries are the best :) Great looking buckle, Mary! What a nice story. People we meet along the way are the best part of an adventure. How great that he could direct you to the berries you were looking for. Lovely cake, Mary. I have berries in the freezer from a farm in Missouri... I'll have to try this next weekend when family is in town. che meraviglia!!! sei sempre bravissima!!baci! I love that you guys stumbled onto the camp...and Jeb is something else! lol Nothing like a little adventure to go along with your blueberry hunting! The "buckle" word is new to me, but looks amazing! My favorite - the buckle! Yours looks fabulous! We saw a Cowboy camp tent this spring when visiting Florida, but we didn't explore. Jeb looks quite a character. How nice that he showed you the blueberry patches! You should bring him a cake! 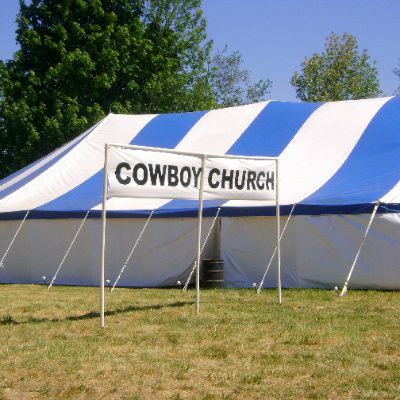 How interesting to discover a cowboy church! 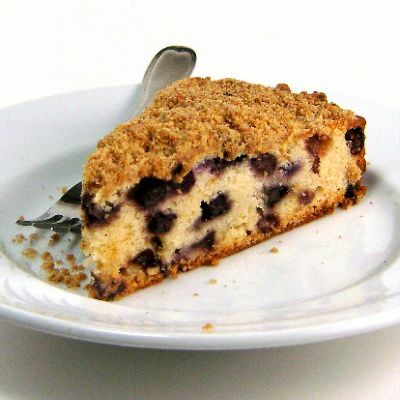 I love the blueberry cake with crumb topping, great way to start the day with a cup of strong black coffee! This would be fantastic at a family holiday gathering, especially a brunch...I enjoyed meeting Jeb and am glad he helped out on your berry quest. Thanks for sharing all of these beautiful fruit desserts, Mary. They're perfect for summer! Love your story too- exploring is so much fun- you never know what you'll find! Mary, will be trying this...I like the topping too. I like blueberries and this buckle seems perfect to have with a cup of coffee. Fresh bluberries? You lucky thing! This looks absolutely delicious and I think I'll have to make this for my mother who is a blueberry lover. Unfortunately we don't have fresh ones..
Ps. I read others comments and I, too, haven't heard of a Buckle. But it looks really delicious and moist. This buckle looks so crunchy. I wonder if I can make it with strawberries, because blueberries are hard if not impossible to find here. I just picked up some super-sweet blues at the market this weekend - goign to try to find some time to make this! Love the story as much as I'm sure I'd love the buckle! Awesome. God bless. I made blueberry buckle thirty years ago but I did not know how it got the name buckle. Learn something new, everyday. I don't have my recipe any more so I will happily try yours. I finally learned the difference between buckles, crisps, clafouties, etc. Blueberry buckle is one of my favorite uses for blueberries. I always try to bake two because the first one goes too fast. I have never heard of Blueberry buckle before! Looks delicious! Jeb doesn't look much like any cowboy I've ever seen! Your blueberry buckle looks delicious, though. Jeb is not your typical Texas cowboy. But when it comes to serving the Lord, that is not important. They have those churches all around here. I love looking at your cake pics they are so delicious and gorgeous! This buckle looks really good and scrumptious too! Hi Mary, we are home from camping and admit to loving our own bed. smile. We had a great family vacation. My grandson 13, made a campfire peach cobbler that was awesome. It fed 18 of us. I should have taken photos. My blog was far from my mind. HA! Blueberry Buckle looks and sounds wonderful. Love your story about the blueberries hunt. What a character Jeb seems to be. A fun adventure. I really enjoy your background on this one... It makes the recipe even more fun. Looks fabulous and I can't wait to try it.